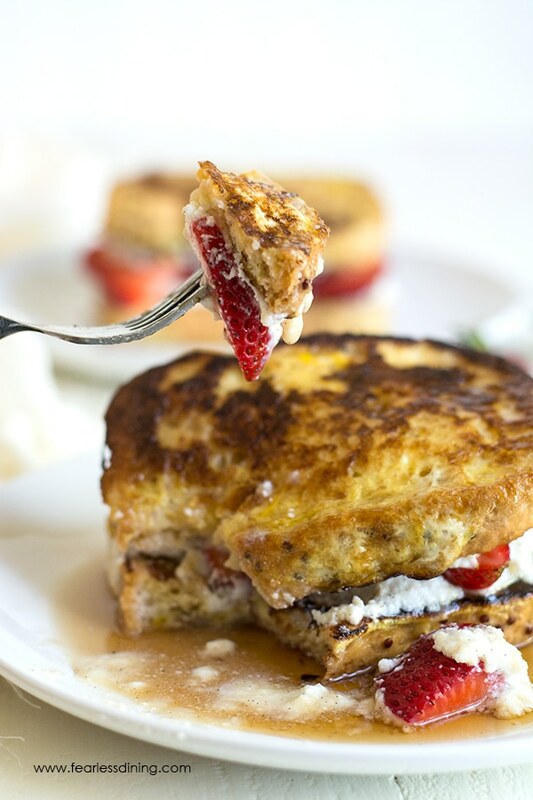 Dive your fork into this easy gluten free vanilla bean ricotta strawberry stuffed French toast. The vanilla and fresh juicy strawberry flavors blend in every bite to make this a delicious breakfast. One of my very favorite things about May is that it is National Strawberry Month. 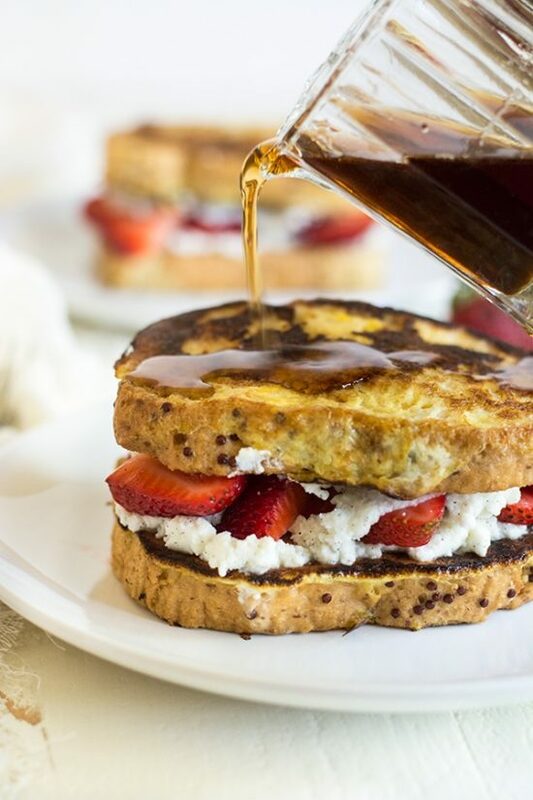 What better way to celebrate than this delicious strawberry stuffed French toast. This is that OMG I could live on this stuff recipe. 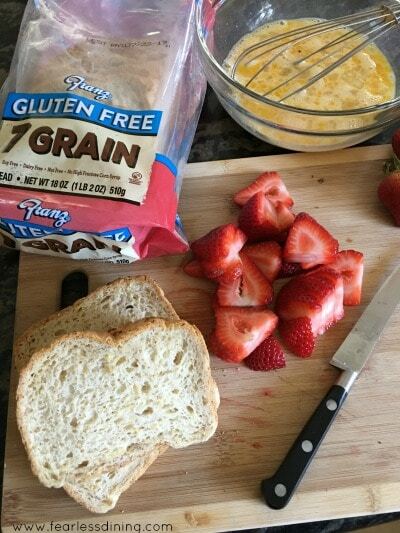 If you have fresh strawberries, and my new favorite certified gluten free bread by Franz Bakery…you are almost all the way to a delicious breakfast! You won’t believe how easy this strawberry stuffed French toast recipe is to make. And if you haven’t heard of Franz Bakery, you will because they are an up and coming bakery. They have a separate facility for their gluten free products and they got their gluten free certification in 2012. Click here to read more about Gluten Free Shopping at Costco. I will get back to today’s special breakfast recipe in a few minutes. I would hardly be doing you justice if I didn’t dedicate a short paragraph to tell you about Franz Gluten Free Bagels. 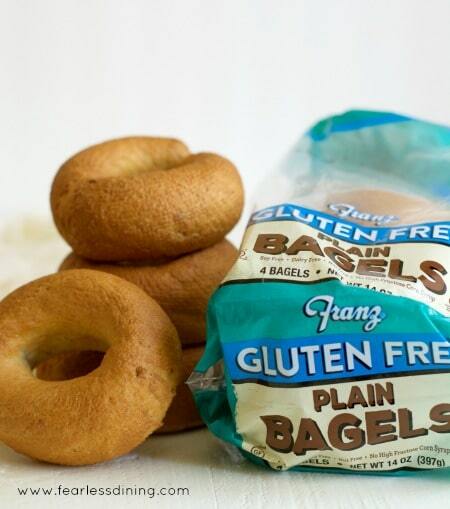 Do you remember before you knew you had to go gluten free…when bagels were slightly chewy and delicious? These gluten free bagels are the first I have found that taste like the real thing!! Are you ready to take a bite? 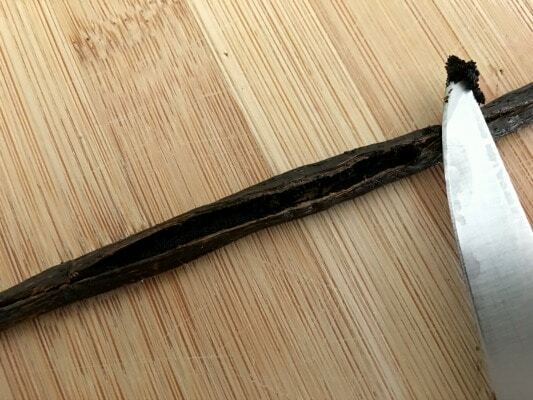 It is really easy to remove the beans from a vanilla pod. I use a small steak knife to cut down the bean lengthwise. Pry open the pod and use the sharp tip of the knife to scrape the beans out of the pod. I do this over a small bowl to capture the beans as they fall. Gather up all of your ingredients! I love how easily the Franz bread works in this recipe. It is moist and doesn’t dry out when cooked. 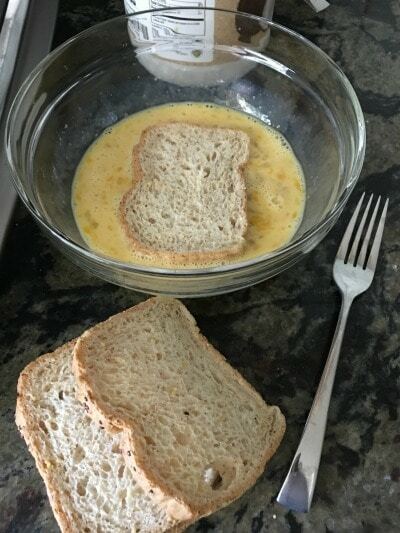 Dip the bread in whisked eggs. Use a fork to flip the bread so both sides soak in the egg evenly. 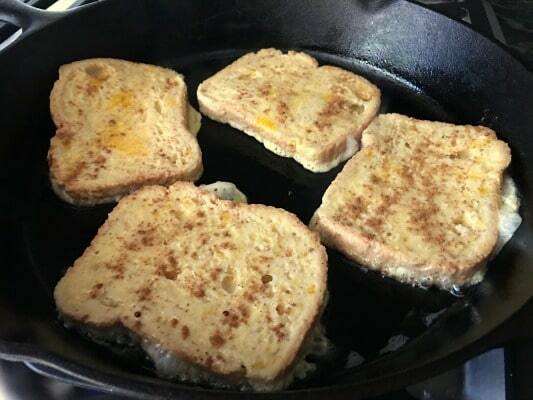 Cook the French toast in a skillet on medium heat. 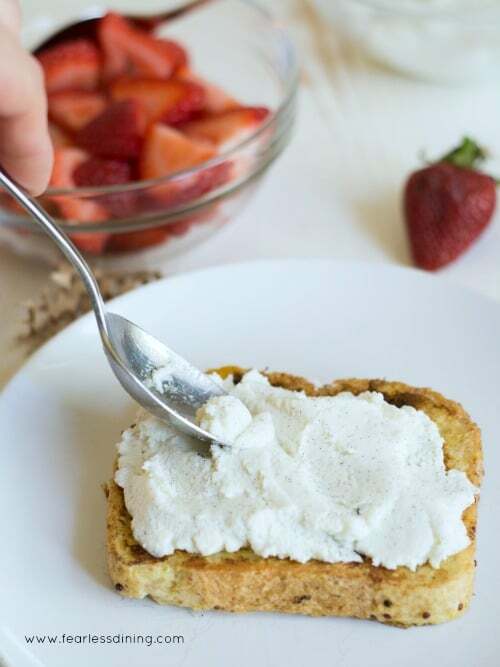 Spread on the vanilla bean ricotta onto a piece of French toast. 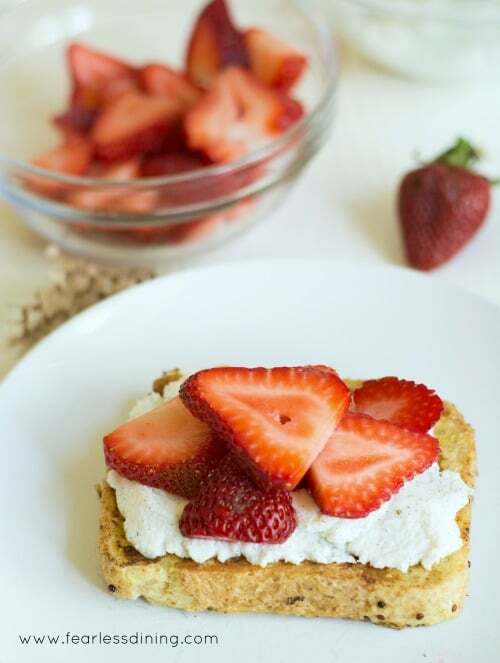 Add fresh strawberries and then add another slice of French toast. I love we can get fresh strawberries year round, but they are so sweet and juicy right now. This is the perfect way to enjoy them for National Strawberry Month! Add syrup and you have a wonderfully delicious breakfast or brunch. 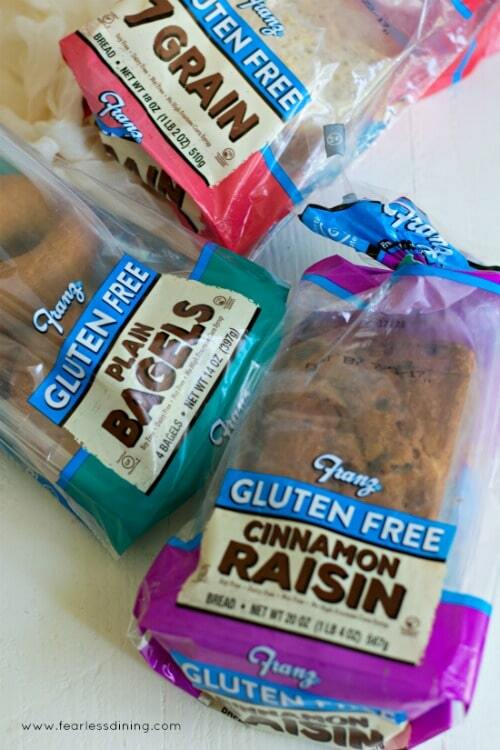 Franz has gluten free product available on Amazon Fresh in The Bay Area and LA. It is also available in Amazon Prime Now in SF, Sacramento, and Oakland and available at 365 Stores by Whole Foods Market in Santa Monica, Silverlake, and Concord, CA. This is an easy strawberry stuffed French toast recipe. In a bowl, add ricotta, vanilla bean, and sugar. Mix well. 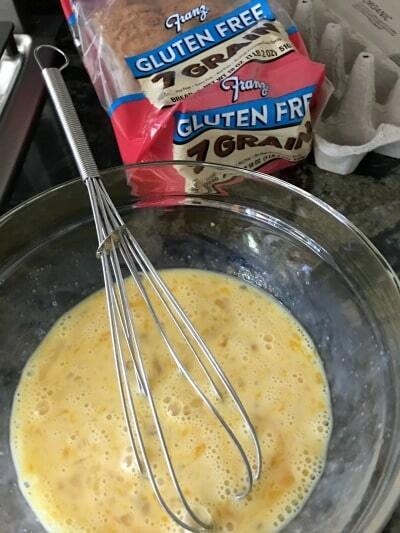 In a large bowl, add eggs and cream and whisk to blend. Heat a skillet on medium heat. Add coconut oil and allow pan to heat. Dip a slice of bread into the egg mixture. Use a fork to turn the bread over so the egg soaks into both sides. Put the egg soaked bread into the skillet. Repeat until the skillet is full of egg soaked bread. Sprinkle each with cinnamon. Flip to the other side and cook. Remove from heat when the French toast is ready. 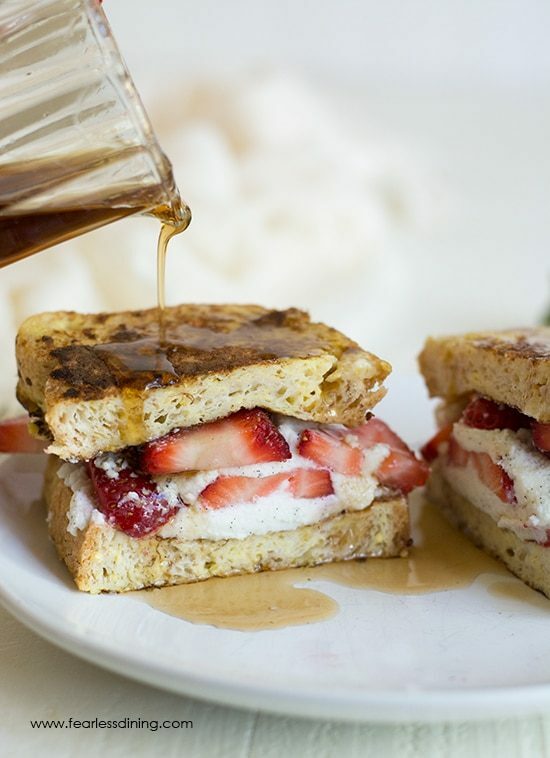 Add ricotta and strawberries to a piece of French toast. Top with another piece of French toast. Add syrup or powdered sugar. Oh my, this looks terrific! 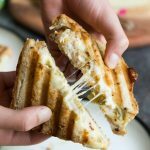 I’d love to spread that vanilla bean ricotta on just about anything! This looks soooo good. Yes, those chewy gluten free bagels were just a no lol. Glad someone has figured out a good formula. Now I want these for breakfast. Agreed Renz, it has been YEARS since I had a bagel that is like this. 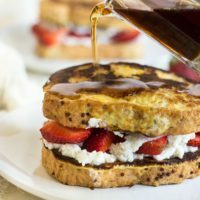 These strawberry stuffed french toast sounds amazing, major plus they are gluten free too.